The Chroma-Keying effect lets you create an alpha channel (transparency zone) for your bitmap image or image sequence. 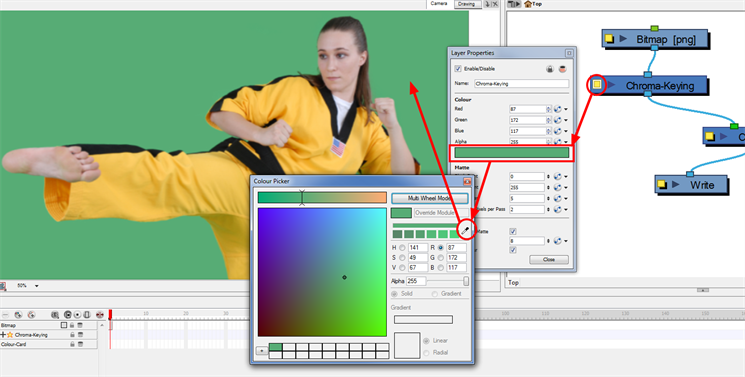 For example, if you have a series of bitmap images with a character filmed on a green screen or blue screen, you can use this module to create an alpha channel based on the screen colour and cut it out from your image sequence. 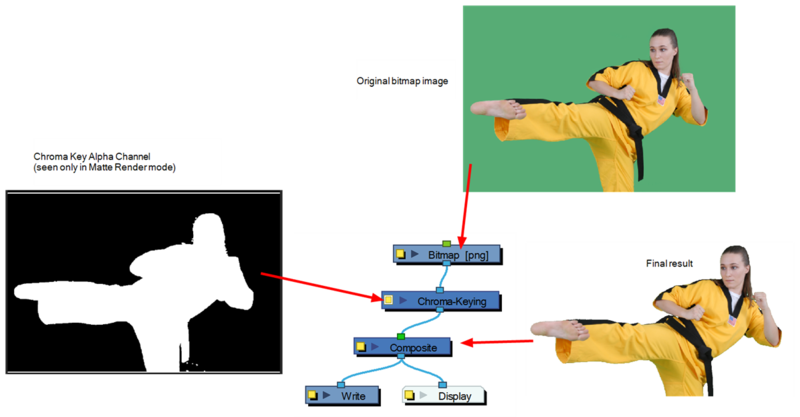 The Chroma-Keying module MUST be connected to a bitmap image. The Chroma-Keying will create an alpha channel that can be seen in the Camera view in the Matte Render Mode. To cut the background colour from your image, you will need to use a Cutter module. To obtain a better result than just extracting the raw colour, you can adjust some parameters such as the contour blurriness and the matte size. You can see all the options available in the Chroma-Keying Properties window. • Red/Green/Blue/Alpha: In the Colour section, you can enter the RGB value for the colour to extract from your image. You can also click on the colour swatch to open the Colour Picker window and select a new window. To select the exact colour in your image, you can use the Eye Dropper found in the Colour Picker window and pick it directly in your image. 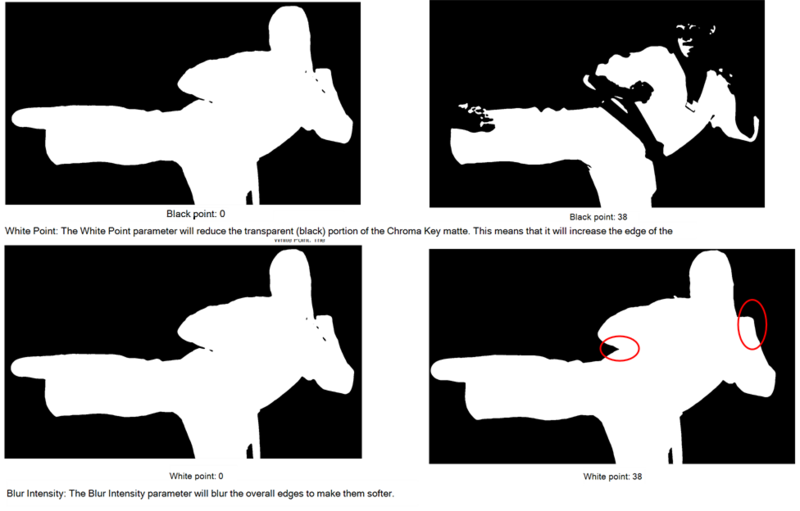 • Black Point: The Black Point parameter will increase the transparent (black) portion of the Chroma Key matte. This means that it will reduce the edge of the visible image. • Adjacent Pixels Per Pass: When blurring the matter edge's with the Blur Intensity parameter, the Adjacent Pixel parameter will blur the matte border with the next few pixels (amount indicated in the field) to create a nicer edge. • Threshold Matte: This option will apply a threshold (tolerance) to the selected colour to be removed. The Threshold amount is set in the Threshold field. • Threshold: The Threshold value will increase or decrease the tolerance for the selected colour to be removed from the image. The higher the value is the more coloured pixels will be considered in the Chroma-Keying matte. 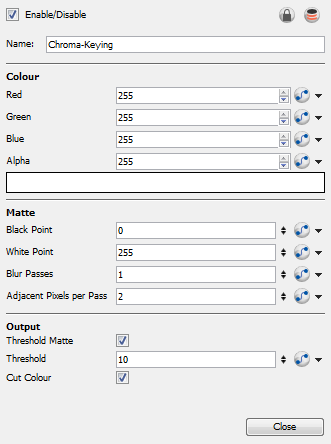 The pixel colour value will not have to be such a close RGB value to the one selected in the colour swatch. The lower the Threshold value, the closer RGB value the pixels will have to be to the selected colour to be part of the matte. • Cut Colour: If this option is enabled, the selected colour will be removed from the image and will leave a transparent zone so that you can see the background and other layers behind the image. If the option is disabled, the colour will remain, but an Alpha channel is created that can be used with any other modules requesting a Matte input.